BY the time the centenary of Karl Marx’s death was marked 35 years ago, devotees of his ideas were struggling to promote their continued relevance. After all, by then the world differed remarkably from the mid-19th-century state of affairs, with most of the advanced capitalist nations capitulating to some extent to the need to ward off Marx’s predictions by instituting welfare states that took the edge off class conflict. However, by 1983 the likes of Margaret Thatcher and Ronald Reagan had already set in motion processes that became relentless in the aftermath of the Soviet collapse. Capitalism, red in tooth and claw, returned with a vengeance in the 1990s, and among its foremost victims were the countries of Eastern Europe that had dared to imagine a different world was possible. Idiots celebrated by proclaiming the end of history. Much of what has occurred since then in the sphere of global economics has served to underline Marx’s prescience; the veracity of his conviction that capitalism carries within it the seeds of its own destruction has been acknowledged even by many of those disturbed by this tendency. The bicentenary of Marx’s birth this week comes at a time when his predictions about the nature and trajectory of capital resonate particularly loudly, given the sharply growing disparities of wealth in all capitalist societies and the reluctance of the ruling classes to do anything that might reduce them. Marx comes across as more of a 20th-century than a 19th-century figure. 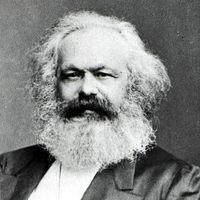 Marx was born on May 5, 1818 into a Jewish family, which shortly afterwards converted to Lutheran Christianity in the face of entr­enched anti-Semitism, in the German town of Trier. His precocious intellect led to conflict with the authorities at both school and university; it also earned him a doctorate by the time he was 23. Not long afterwards he became the editor of Rheinische Zeitung, which was promptly shut down by the Prussian authorities. Marx felt obliged to shift to Paris and, when expelled from there, to Brussels. The Prussian state continued to hound him, though. He returned to France and, when Europe erupted in 1848, shortly after he and a recently befriended fellow German by the name of Friedrich Engels had published The Manifesto of the Communist Party, he went back to Ger­many and founded the Neue Rheinische Zeitung. This entry was posted on Tuesday, June 5th, 2018 at 00:01	and is filed under Uncategorized. You can follow any responses to this entry through the RSS 2.0 feed. Both comments and pings are currently closed.